Hi Fairphoners in and around Aachen! We are currently scheduling a casual pub meeting in Aachen the coming month (September). There will be no particular agenda and we have no plans so far to formalize this, it’s primarily about getting in touch, but if we can help with any issues with your Fairphone, we might have a look at it as well, of course (no miracles promised ). While the exact date and location in downtown Aachen is not decided upon yet, I would like to encourage everyone interested to contact me here or email urs.lesse[at]gmx•de for further information (I will send you a doodle link for exact scheduling). P.S. : I speak German and English only, sorry! Having met for the first time in the year 2015, we have done without formal agendas for our meetups, allowing everyone with an interest in the Fairphone to join us without any obligations – regardless of whether you own a Fairphone or not. We do set one requirement though: Bring some curiousity! Feel free to email me if you are interested and want another meeting to happen (would be great if any Euregio neighbours would get in touch, too). There is a new Community Manager in town: meet Monica! 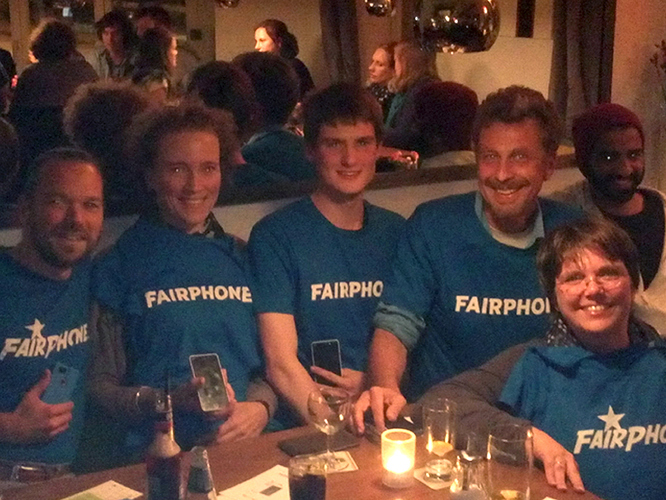 Everybody welcome: Fairphone owners, buyers and of course everyone who’s just interested and curious! schöne Idee! Um wieviel Uhr ist das Treffen? danke für deine Rückmeldung und den sehr hilfreichen Hinweis auf die entscheidende Lücke in meiner Ankündigung, die ich jetzt auch geschlossen habe. Kannst du den Link auch in den ersten Post geben, damit man ihn sofort findet? I’m quite optimistic we’ll be half a dozen, and a few have shown strong interest as well, but cannot make it that day. Nice picture! It seems that you were having fun! Der zweite Aachener Fairphone-Stammtisch soll im NOVEMBER stattfinden Wer Interesse hat, zu kommen, ist herzlich eingeladen, sich bei mir per persönlicher MESSAGE oder per E-mail an urs.lesse [ät] gmx.de zu melden. Ich lasse Euch dann den Link zur Doodle-Terminumfrage zukommen – so können alle Interessierten an der Terminfindung mitwirken. We are eyeing a second meeting this NOVEMBER If you are interested, just send me a private MESSAGE here oder email me at urs.lesse [at] gmx.de to get a doodle poll link so you can take part in the scheduling. Der 2. 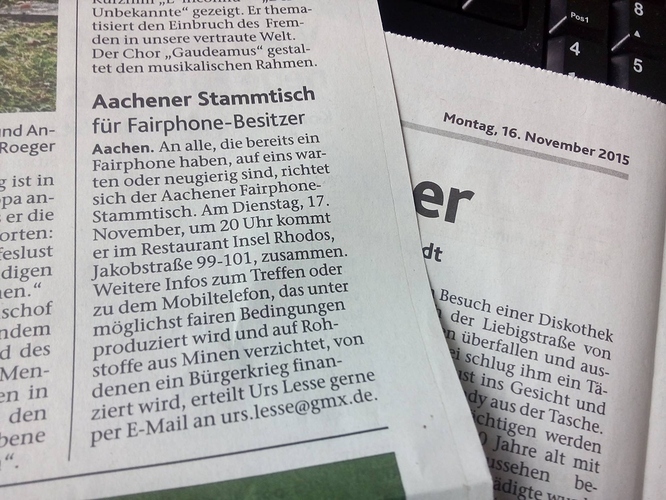 Aachener Fairphone-Stammtisch findet nun genau zwei Monate nach dem Auftakt statt, also am Dienstag, 17. November um 20.00 Uhr im Restaurant Insel Rhodos. Wir freuen uns auf alle Interessierten – egal, ob schon “versorgt” mit einem Fairphone, noch sehnsüchtig auf das FP2 wartend oder auch noch gänzlich unentschieden und einfach nur neugierig! 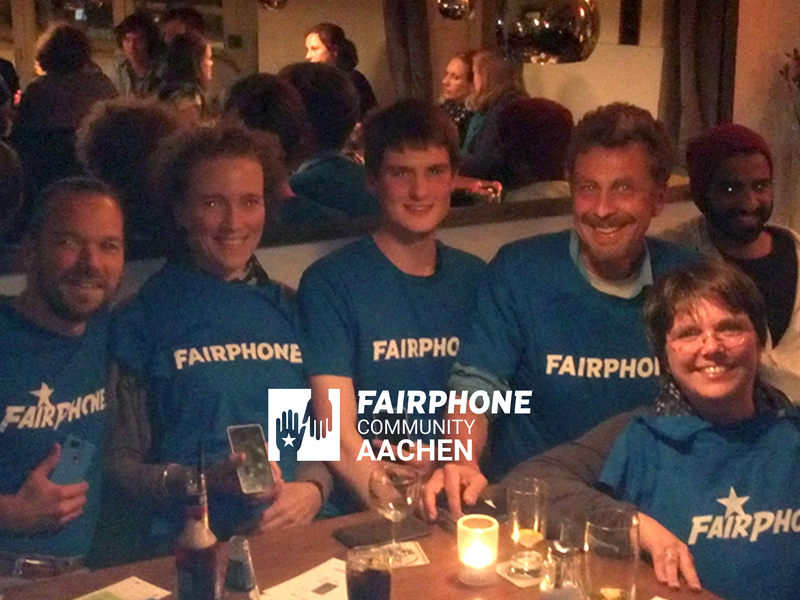 Our 2nd Aachen Fairphone meet-up will take place exactly two months after the initial one: Tuesday, 17 November at 8 pm at restaurant Insel Rhodos We are looking forward to meet you regardless of whether you already own a Fairphone, are waiting impatiently for your FP2 or are still undecided and/or just curious! Since the date got set, I added it to the List of upcoming community meetups/events. So how did it go? Can we see pictures? PS: I just now saw that you had posted a pic with a newspaper article. Which newspaper is it, and did people contact you / go to the meetup because of it? I have to confess I did not think of taking a photo this time. We were seven this time (= everyone who had indicated in advance to turn up). Three “returns” from the first meetup, four people who were there for the first time. No unexpected visitor this time, so the newspaper paragraph (see further above) did not trigger any spontaneous “additions”. I had only sent a brief email to Aachen’s two newspapers three days prior (saturday -> tuesday) to our meetup. To my surprise, the one paper (Aachener Nachrichten) which picked it up actually doubled the length of my text suggestion. Expecting I would be lucky to even just get it included in the telegram-style events list I had not included the bits about what Fairphone is actually about, so someone at the paper must have added or even researched it. Now that the first FP2s are gradually hitting Aachen, we are scheduling our third pub meeting, our first in the year 2016. Anyone who wants to join us and vote in the scheduling (and hasn’t received my doodle link yet) please PM me here or email me at urs.lesse AT gmx.de Of course, I will inform everyone here once a date and venue has been settled for. Da nun die ersten FP2s in und um Aachen eintrudeln, machen wir uns daran, einen Termin für unser drittes Treffen zu finden. Wer dabei sein und abstimmen möchte über den Termin (und von mir nicht schon mit einem entsprechenden Link beschickt worden ist), setze sich bitte mit mir hier über PM oder direkt per E-Mail an urs.lesse bei gmx.de in Verbindung. Ich schicke Euch dann so bald wie möglich einen doodle-Link zu. Be sure to add the date to the List of upcoming community meetups, as soon as it is settled! gänzlich unentschieden und einfach nur neugierig! Herzlich willkommen! undecided and/or just curious! Welcome!